If you are like me you love stamp kiloware and must refrain yourself from buying too much of them. Personally, I do not collect worldwide stamps. I specialized in a few area. So logically, I should not be buying stamp kiloware. Yet I do. I even run a blog almost entirely dedicated to kiloware. I browse Ebay almost daily looking at kiloware. I talk about kiloware on philatelic discussion boards. I am a kiloware addict. 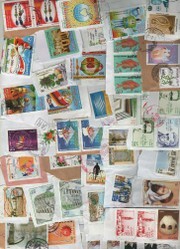 So, what do I do with all those kilos of stamps on paper I don't really collect? I sort, make piles, look at them, make more piles and tell myself I won't buy them anymore. Until next time. And there is always a next time. So the point of this page is to share a few tips on the best way to sort and prepare your kiloware either for soaking and adding to your collection, or to resell for (maybe) profit. Or both: keep what you need, resell the rest. Never ever soak your stamps before sorting them. You will loose time and may also damage some of the stamps. Pre-sorting your stamps will allow you to remove the damage ones, colored paper that may damage other stamps and excess paper that will make soaking time longer. Don't use the kitchen table. It is a waste of time if you have to remove the stamps from the table for the meals! Use your desk, or better a small camping table, set it in a place with good lighting and leave it there until the work is done. Don't wait too long before starting to sort your kiloware lots. Otherwise they accumulate and the job will be overwhelming! You will get discouraged, packed everything and sell for a loss. As soon as you buy a lot, try working on it. This is my own mehod. There is no "good" method, yours is as good as mine. But I am sharing my kiloware sorting method with you (you can share yours in the guestbook below). While I work the stamp kiloware bag or box, I remove all damage stamps, I also trim close and remove double paper. For countries I know I won't get that many stamps I make a mix pile that will end up containing only 1 or 2 stamps of each rare countries. I also set aside uncancelled stamps from a couple of countries such as Canada, USA, Australia, Great Britain. These can be soaked and sell under face as postage. I also set aside the unusual slogan cancel. Some stamp collectors buy them. Once I am done with a kiloware bag, I pack every little pile of stamps in zip lock until I am ready to sell or soak them. Great tips. I don't collect stamps, but I do coupon and I can certainly use some of your super tips for that hobby/activity, too!